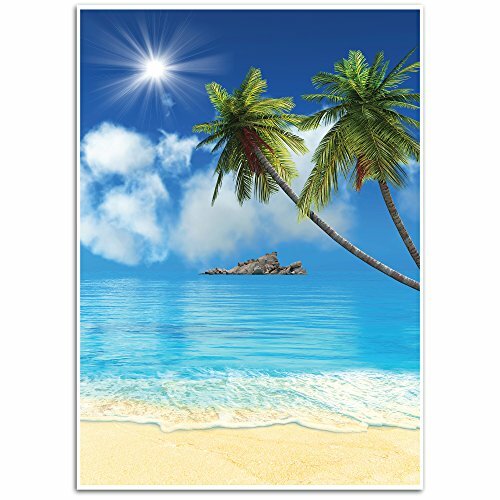 This non-reflective backdrop features a realistic beach scene complete with palm tree and islands in the distant background. Made of polyester fabric, it is lightweight and foldable for maximum portability and convenience. Use this backdrop in studios, booths, during parties, and for weddings & business/commercial use. Can also be used for newborn baby, children and product photography. Not just for photography, also functions as a video backdrop. Customize with some props to make it your own. This backdrop measures 4.9 x 7.2 feet. CARE INSTRUCTIONS: Wipe away dirt and dust with a dry cloth or brush. Do not wash with water. TROPICAL BEACH BACKDROP: This backdrop features a realistic beach scene complete with palm tree and islands in the distant background. It is lightweight and foldable for maximum portability and convenience. This does not include additional accessories for hanging. VERSATILE: Use this backdrop in studios, booths, during parties, and for weddings & business/commercial use. Can also be used for newborn baby, children and product photography. GREAT FOR VIDEO USE: Not just for photography, also functions as a video backdrop. Customize with some props to make it your own. NON-REFLECTIVE: Reflective light won't ruin your pictures! DIMENSIONS: This backdrop measures 4.9 x 7.2 feet.